Bio: Maria Paterson was born in Scotland, and emigrated with her family to Australia when young. She first settled in Sydney, and as a teenager moved to the Northern Rivers region of New South Wales where most of her art has been created. Maria began her art studies when she was 17, attending Meadowbank TAFE (Technical And Further Education). She has experimented with most painting mediums, favouring oils and pastels, but she has also made sculptures in ceramics and other materials. After completing a B.A. at Southern Cross University, she worked on large scale pastels in a figurative style for the corporate market in Queensland. From these works emerged the still life and interior narratives where objects take on personal meanings, work strongly influenced by reflections about life around us. Maria has been painting for 25 years, is an award-winning pastellist, and has had numerous group and solo exhibitions. Subjects: Landscape; Figures in landscape; Still Life. Navigation: Main menu disappears once you open a gallery. You need to use the back button to navigate to the main page, or else open the gallery in a new window/tab. Image View: Each gallery opens in a new window. The thumbnails may be viewed singly, or in a slideshow. The images may be downloaded. Unfortunately no information is provided on the original size of the painting. This would have been of especial interest as Maria makes a point of mentioning “large-scale” pastels in her biographical information. I have chosen the image Sheepstation as it is the nearest thing I have seen in contemporary art to Henri (le Douanier) Rousseau. It is 450 x 351, 126 KB. Bio: Vivian Kral was born in Brussels in 1963. Her father, who was a commercial artist, encouraged her to improve her evident talent for drawing and painting. After secondary school she attended La Cambre (ENSAV – Ecole Nationale Supérieure des Arts Visuels) in Brussels. Her favourite subjects have been the piers in Oostende, and urban sites in Brussels. Vivian says: What I mostly like is to render space, perspective, light playing with the characters and the objects. Subjects: Urban and industrial landscape. Navigation: This French website is one of those that hosts members, and as such Vivian’s work is in a webpage, rather than on her own site. The advertisements are irritating, but it is worth the effort to view the amazing work. Gallery: Pier on piles; Old stores; Workshops; Grand Palais; Factories; Towns. Image View: Each thumbnail opens on a new page. You need to use the back button to return to the gallery page, unless you enlarge each image in a new tab/window. Enlargements can be saved. 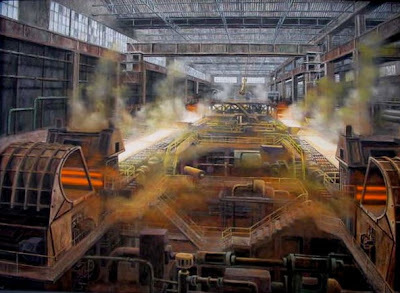 This image, one of several entitled Steelworks, is 100x140 cm, 592 x 434, 78 KB. Bio: Christiane was born in 1951 in Authier, Abitibi-Témiscamingue, a region located in western Quebec, Canada, along the Ontario. From 1970 to 2004, she taught art at secondary level, while pursuing vocational training courses: Certificates in Plastics Arts, oil painting, pottery, enamel on copper, watercolor and pastel. Since 1986, she has devoted herself to pastel, and has studied with Max Stiebel, Dave Beckett, Daniel Green, Ben Konis, Christina Debarry and Albert Handel. 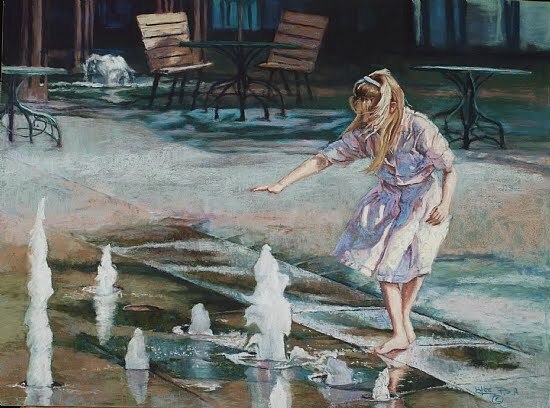 She is a Premier Pastellist with the Pastel Society of Canada and a signature member of the Pastel Society of America and the Pastel Society of Eastern Canada. She is also a member of the Portrait Society of Canada and the Circle of Painters and Sculptors of Quebec. Several of her paintings are in public collections. She has received numerous awards and citations since 1989 and has exhibited in Quebec, Canada, the United States, Portugal and France. Several of her works have been published as art editions for large companies in Quebec. Subjects: Landscape; Portraits; Still Life. Navigation: This website is in French. Main menu remains available at top of page. Gallery: Paysages d’eau, (waterscapes); Paysages de terre (landscapes); Natures mortes (Still life); Portraits; Divers (other). Image View: Each gallery opens in a new window. The thumbnails may be viewed singly, or in a slideshow (diaporama). The display is Adobe Flash, hence no download possible, except for the usual workaround. Printemps (Spring) is 16 x 20 ins. One for the collector and lover of pastels - a limited edition book of Claude Texier's pastel paintings. Madame Claude Texier spent the first twenty years of her life in Morocco, which has greatly influenced her art subsequently. Her passion for drawing and painting, recognised by Edmond Vales, her art teacher, led her to devote herself to painting in pastel. A Maitre Pastelliste of the Société de Pastellistes de France, she has also been recognised as a Master Pastellist by the Pastel Society of America. 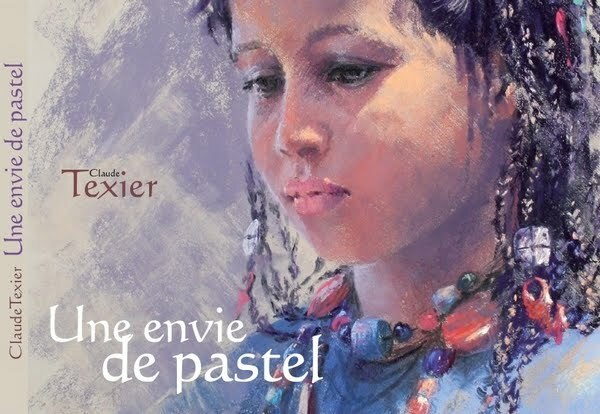 I don't keep a league table of pastel artists on this blog, but I have already nominated Claude Texier among my top ten pastel artists in a previous post.
" My intention is not to write a book on the theory or practice of pastel. There are so many different techniques, mine is just one of many. It is in fact a book of paintings that I would like to share with those I love, and those who appreciate my work ". The book is a limited edition art book of 108 pages, landscape format (23 x 29 cm). Text in French (but paintings are universal!). Can be ordered by mail (within the limits of the available stock). The price of the book is 60 € (add postal charges, according to the country of destination - should amount to about €4.50 for USA, Canada, Europe. The first 100 orders will have a personalized dedication. "Consacrée Master Pastellist par la célèbre Pastel Society of America en 2007, Claude Texier est aujourd'hui reconnue bien au-delà (l'hexagone) , La beauté des lumières chaudes et diffuses alliée à la justesse du dessin, la qualité de la composition et la maîtrise de la couleur s'expriment à travers un savoir-faire singulier qui suscite une profonde émotion chez le spectateur. Une forte exigence personelle et une remise en cause régulière constituent certainement le secret de Claude Texier, artiste discrète qui préfère laisser parler ses pastels à sa place." Je suis tout à fait d'accord. Claude Texier reste toujours parmi mes preferées de toutes les patellistes du monde. "Mon intention n’est pas de faire un livre de conseils ou de pratique du pastel. Il existe tellement de techniques différentes pour le pratiquer, la mienne en est une parmi d’autres. En fait, c’est un livre d’images que je voudrais partager avec ceux que j’aime, et ceux qui apprécient mon travail". 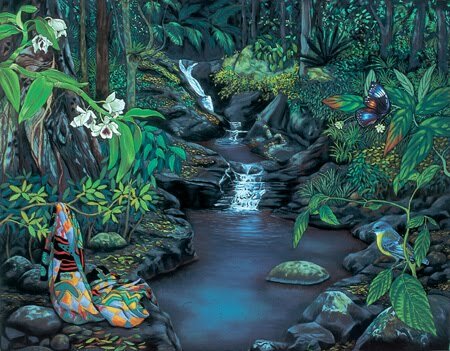 Bio: Chris Chapman was born in 1950 in Pasadena, and trained in the University of Oregon and U. Cal. at Santa Barbara. She has taught landscape painting in Santa Barbara City College; and the exacting art of botanical illustration at the Wildling Museum, Los Olivos, Ca., and at Santa Barbara Botanic Garden. Chris Chapman’s California landscapes are forthright and honest. Chris spent her childhood exploring the foothills and orchards on horseback. While most of her plein air work centres on her Santa Barbara home grounds, Chris ranges farther afield, collecting plants for her botanical work, thus engaging in a closer encounter with the landscape. Chris is a member of the Oak Group, (as was the late Glenna Hartmann) - a Santa Barbara based group of landscape painters formed in 1986 whence it has raised well over a million dollars to preserve endangered environments and her work is included in a feature about the Oak Group in American Artist Plein Air Issue, Fall 2011. She is an Honorary Lifetime Member of the Santa Barbara Art Association, a Signature Member of the Pastel Society of America, and member of American Society of Botanical Artists. Navigation: Main menu remains available at bottom of page. Gallery: Watercolors (3 pages); Pastels (3 pages); Botanical Illustration (3 pages); Archive (3 pages). Image View: Clicking on the thumbnails enlarges them in a pop-up window, where information on size etc. is presented You cannot scroll through the enlargements, but must open each one individually. The enlargements may be saved. Perfect Day is 12 x 17 ins. 504 x 337, 76.8 KB. Bio: Born in 1977, Carolyn Robles received her BFA in 2000 from Northern Arizona University. She moved to Europe 2003-2007 where she continued her studies in Stedlijke Academie in Brugge, Belgium, the Academie d’Art in Valencia, Spain, as well as self-directed studies while in Nice - visiting museums and cathedrals all the while, where she says she found her greatest teachers. When she returned to the U.S.A. she enrolled as a student at Laguna College of Art & Design (LCAD), graduating with an MFA in painting. 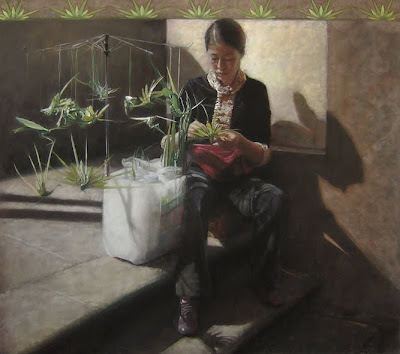 Carolyn put her sojourn in Valencia to good use, being awarded the 2009 Jack Richeson/Unison Pastels Best of Show award in the Pastel Journal. Carolyn's winning portrait Fallera in Turquoise was inspired while she was attending a festival in Valencia, Spain. The falleras are the young women chosen to represent each neighborhood during the Fallas festival. The painting can be seen on he website, along with some other Spain-inspired pastels. Carolyn is currently based in Huntington Beach, Ca. Medium: Pastel, oil. Carolyn has been working with a relatively small collection of pastels, which she claims forces her to seek out value rather than colour first. Navigation: Simple main menu is on top of page. Gallery: Portfolio of 12 paintings in pastel and in oil. You will wish for more. Image View: Clicking on the thumbnails enlarges them on same page, and you can scroll through the enlargements. Right click on the bigger picture to open in a new window, from where you can download the jpg. file. Carolyn says of her painting Origami: “I was walking around the city (Florence) and I saw this lady on the steps making origami bugs and selling them to tourists. She was really lost in her craft... It was very nice, and the light was beautiful." Origami is 28 x 32 ins. 667 x 591, 382 KB. Bio: Annie Gross trained as a musician and taught piano for nearly 40 years. (An uncle took up painting on retirement, although colorblind.) From these auspicious beginnigs, Annie stared to paint in 2000. A native of Pas de Calais, Annie retired from 25 years in Lorraine to Perigord in 1999, where the landscapes inspired her to swap music for painting. Taught by Mary Robiche, Annie made rapid progress. What began as a whim turned into a passion. A series of classes with Peter Thomas and Chris Serrurier in 2005 confirmed her preference for pastel. In 2008 her persistence was rewarded with a prize from the municipality of Sourzac. Annie now lives and paints in Saint-Medard-de-Mussidan, Dordogne. Navigation: This website is in French, (except for some translation of painting titles.) There is a somewhat fractured English option, in the style of Welkom in my website. Main menu is at the left side. Gallery: In the French version, with the exception of Aquarelles and Huiles (watercolour and oils, respectively) all the other galleries contain pastels. There may be several pages of these, although confusingly the rubric asks you to click on the image suivante – the next image rather than on the next page. When you do this, do not be confused either by the fact that the lead image on each page is always the same one. Image View: Clicking on the thumbnails enlarges them in a separate window, but does not allow download. Don’t omit to check out Grands Formats, which is a page of enlargements that again disallows the right click/save as option. Here we go again. Surely everyone knows how to use Prt Sc by now! There is no indication of the size of the originals, although at St. Aulaye this year Annie's three offerings were each 40 x 50 cm. Bio: Brigitte Charles was born 1953, and lives in Creuzier-le-Vieux (Allier) Auvergne, France. 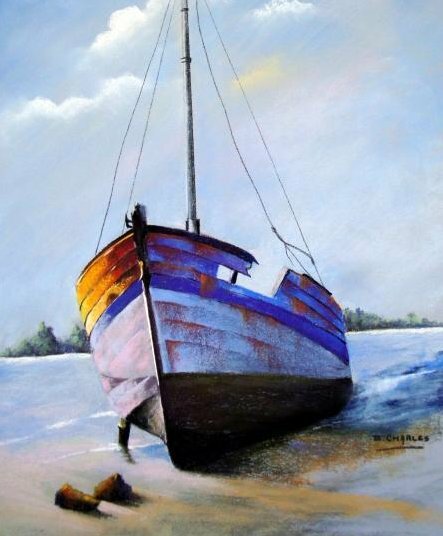 She has exhibited widely in France and won the 1st prize Pastel Girault at St. Aulaye, 2010, with her painting Low Tide. Like Brigitte Bouron, Brigitte Charles studied pastel for three years with Jean-Claude Marc; she has also participated in classes with Patrice Bourdin and Claude Texier. Brigitte states: Depuis mon enfance, j'ai toujours aimé le dessin. Durant quelques années en stand by pour raisons familiales et professionnelles, j'ai gardé une passion pour tout ce qui touche à la peinture et à l'art en général. Je suis membre de l'atelier Robert Mermet à Cusset (03) où j'ai appris la technique du pastel avec JC Marc, ancien élève de M. Robert Mermet, sculpteur bourbonnais. Je coache les débutants au pastel. Le pastel est ma technique de prédilection. J'aime jouer avec les transparences de couleurs, la lumière et l'aspect flouté. À l'occasion de stages, je suis l'élève de Claude Texier, maître pastelliste internationale. Je participe à de nombreuses expositions telles que : Salon du Pastel en Bretagne, Salon du Pastel en Val de Loire, Salon du Pastel à Lyon, Salon du Pastel en Périgord, salons animaliers et diverses manifestations régionales et nationales. Navigation: This French website has an English version. Like the previous post, it is powered by Artmajeur, a commercial online gallery. To view the images, click on Artworks. Gallery: All the artwork is visible on the one page. Click on the subgallery title to view its content. Image View: The images enlarge in a slideshow and cannot be downloaded without resorting to the Prt Sc option. A Marée Basse (Low Tide) is 50x65 cms..
Bio: Born France 1959. For nine years she studied drawing and pastel with Jean-Claude Marc, himself a pupil of the sculptor Robert Mermet. She has participated, and won awards, in several exhibitions on the region of Auvergne. She resides in Gacon, Molles, near Vichy. Brigitte states: Pendant neuf ans j'ai appris le dessin et le pastel avec Jean-Claude MARC, ancien élève du sculpteur Robert MERMET, aujourd'hui qu'il n'est plus parmi nous, nous avons repris l'atelier et essayons de faire perdurer ses conseils. Je travaille le pastel, l'huile, l'acrylique et réalise des modelages. Je participe à plusieurs expositions en auvergne et ai obtenu quelques prix déjà. Ma technique de prédilection reste le pastel avec lequel j'essaie d'exprimer mes états d'âme. Les années passant la passion est plus forte encore, et il ne passe pas une semaine sans que je ne sois baignée dans cet art. Navigation: This French website has an English version. It is powered by Artmajeur, a commercial online gallery. To view the images, click on Artworks. Image View: The images enlarge in a slideshow and cannot be downloaded without resorting to the Prt Sc option. 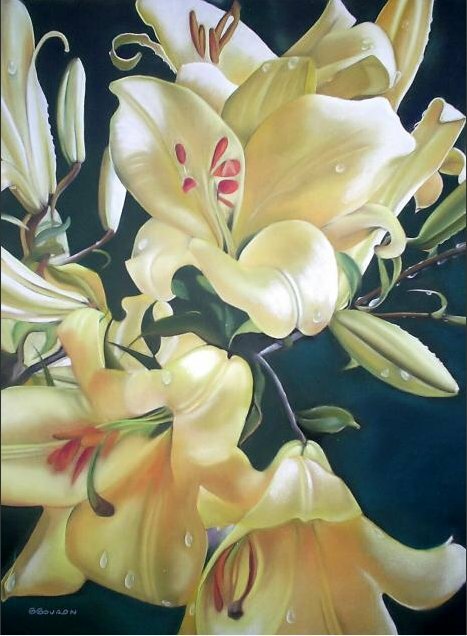 Yellow Lilies is 50x6o cms..
Bio:Bonita Paulis is a member of the Tahoe Art League, the regional representative of the Pastel Society of the West Coast, and a signature member of the Sierra Pastel Society. She has been living and painting in the Lake Tahoe region for 25 years, where she finds an inexhaustible source of inspiration. Navigation: This website is actually a blog, although the URL gives no hint of this. There is no gallery as such, just scroll down the page to view the paintings. Those on the main page may generally be clicked on to enlarge, those to the right have no hyperlink. Also, those paintings at the bottom of the web page, when you have scrolled down fully, do not link to enlargements. Blog: The website is a blog. Bio: Largely self taught, Bev Lee began to devote more time to art ten years ago, when her children were grown. She has taken classes at Mesa State College and Colorado Mountain College. She has also attended workshops with Doug Dawson, Terry Ludwig, Xiang Zhang, and Daniel Greene. 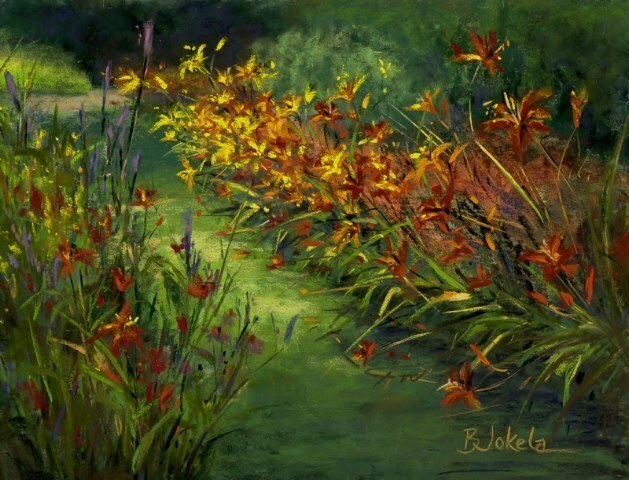 Bev has been juried into numerous competitions and has received over fifty awards. Her paintings are in both private and corporate collections around the country. She has had works published in the May 2002 Pastel Artist International, the November 2003 Artist Magazine, and the October/November 2005 issue of The International Artist Magazine. She had a feature article on her art and practice in the October 2004 of the Pastel Journal, and in December 2008 the Journal published a step-by-step guide to capturing a likeness, excerpted from her book (vide infra). Publications: Painting Children, secrets to capturing childhood moments, North Light Books/Fw publications, 2008. ISBN 978-1-60061-038-7. Navigation: Main menu remains on top. This is an atypical FineArtStudioOnline website – unless the format has changed. I found all the pages slower than usual to load – was it just my connection? Gallery: Children’s portraits; Adult portraits; Animal Art; Floral Still Life. Each gallery has an option to view archived works. This links to a webpage where among the choices is View Archived Works – this is a dead link, leading nowhere at all. Just click on the word All to see two pages comprised of 30 images. Bio: Becky Jokela lives on a farm near Cannon Falls, Minnesota, overlooking Sogn Valley. She began studying art at the University of Oregon and later graduated with a degree in Art Education from the University of Minnesota. Becky Jokela has been teaching art to Zumbrota-Mazeppa high school and elementary students since 1985. Navigation: Main menu remains at side. Gallery: Paintings (available paintings); Portfolio (archive of sold work). Bio: Born near St. Louis, Missouri, Becky Johnson spent her childhood traveling extensively with her military family. From her earliest years, drawing was her chief creative outlet, and after moving to Green Mountain Falls, Colorado in 1972, she began to pursue painting as a full-time career. 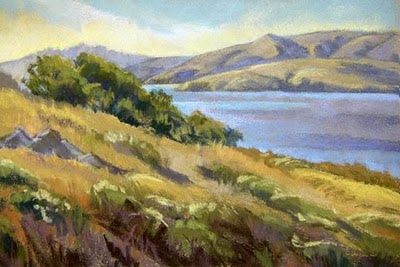 After an early focus on painting wildlife, in recent years landscape, often en plein air, has become her primary focus. Becky participates in juried and invitational exhibitions throughout the west and Midwest, and her work has received numerous awards. Her work is displayed in collections throughout the United States and overseas, including in the permanent collection of the Mulvane Art Museum, Topeka, Kansas, and the permanent collection of the University of Nebraska, Lincoln, Nebraska. 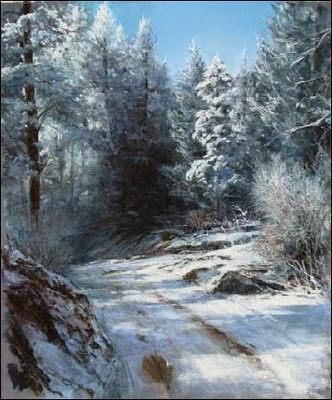 In 2010 she won Second Prize - Animals and Wildlife Category, Pastel 100 National Competition, The Pastel Journal and in 2009 the People's Choice, Douglas Invitational Art Show, Douglas Wyoming. Style: Representational. Becky often works in small formats, which she feels keeps her work fresh and loose as she doesn’t have to get snared in the detail. Image View: Going to the first gallery back reveals some half-a-dozen images, and a further link, More Originals, which brings you through a further ten pages of images. Only those on the last few pages have been enabled for enlargement. Download is permitted. Heading Home is 18.5 x 15.5 ins, 383 x 442, 39.4 KB. I chose it because it's unseasonably cold in Ireland at the moment, and Becky's painting shows me how much colder it can be elsewhere! Bio: Raised in Lancashire, British artist Ann Wilkinson studied painting at Oldham School of Art and the Manchester College of Art. She moved to the Midlands where she taught both art and dressmaking, married and had her family. Gradually she eased out of full-time teaching, into adult education and eventually was able to concentrate on her own art. She was elected as a member of the Royal Birmingham Society of Artists in 1998. In 1996, 1997 and 1998 she spent periods of time in Oman teaching, painting and exhibiting her work. Originally Ann worked exclusively in oils but about 20 years ago she inherited a set of pastels and fell in love with the medium. 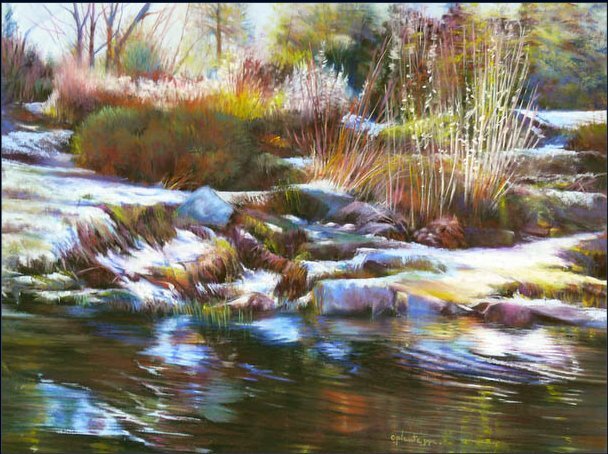 In 2002 she moved to Surrey and she became a member of the UK Pastel Society in 2005. She is now a committee member. 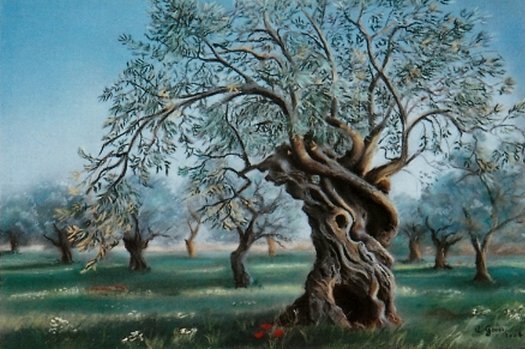 Ann exhibits regularly with the Royal Birmingham Society of Artists, the Birmingham Pastel Society, the Pastel Society and the Reigate Society of Artists. In 2006 she exhibited with the Society of Marine Artists. Ann was featured in the August 2008 issue of the Pastel Journal, and in special hors-série issue of the French Pratique des Arts, October 2010, which dealt in depth with her technique. Medium: Pastel, oil. Ann works mainly in pastel on an acrylic base. She works on dark green mountboard to which she applies thin washes of acrylic mixed with texturizing paste over her detailed charcoal drawing. The outlines around the objects in her paintings – remniscent of Alan Flattmann and Patrick Martin – are usually the dark underpainting showing through. She loves to have a “soft” effect in her work and to this end has an extrensive collection of “white” pastels in many tints of pink, blue, green and grey. Style: Stylised representational. Ann is fascinated by pattern, and flattens the picture plane and plays with perspective to achieve her vision. A distinctive feature of her still lifes is the high viewpoint, foreshortening the objects and greatly reducing or eliminating the background. Image View: Twenty three thumbnails are featured on Ann’s website. You can click on each one to enlarge it and then progress through the enlargements; or choose Slideshow to open the images in a pop-up window, Curiously, the images give details of their resolution and file size, but not that of the original painting. The paintings are in fact usually 22.5 inches square. They may be downloaded. 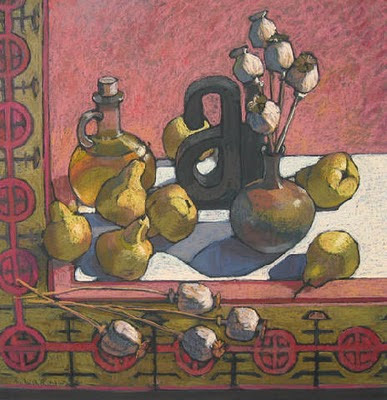 Still Life With Poppy Heads won the RBSA award 2009 and is 484x480, 55 KB.